1973 Warner Bros. had its first major hit with the sensational and shocking The Exorcist (1973) about devil possession, an originally X-rated film that was released as an uncut 'R' rating which allowed minors to view the film if accompanied by an adult. The Exorcist was notable for being one of the biggest box-office successes (and one of the first 'blockbusters' in film history, predating Jaws (1975)), and surpassing The Godfather (1972) as the biggest money-maker of its time (it eventually grossed $193 million domestically). And it remains one of the few horror films nominated for Best Picture. However, it was also one of the most opposed films for its controversial content. The landmark supernatural film encouraged the trend for big-budget horror films, other cheaply-made imitations - and more blockbusters. 1973 The once-powerful MGM Studios abandoned most of its movie-making business because of a string of failures due to ownership changes and bad production choices by head Kirk Kerkorian, who sold MGM's distribution system, and gradually distanced himself from the daily operation of the studio. 1973 The Best Picture winner The Sting (1973) had a number of notables: (1) it was the first Universal Studios film to win the Best Picture Oscar since All Quiet on the Western Front (1930); (2) Edith Head won her 8th and final Best Costume Design Academy Award; (3) Julia Phillips, one of the film's producers, became the first woman to be nominated for and to win the Academy Award for Best Picture. 1973 The science-fiction classic thriller Westworld (1973) by writer/director-novelist Michael Crichton, was the first feature-length movie to make significant use of "digitized image processing," a primitive term for what has evolved into CGI (computer-generated imagery) in the present day. It marked the first use of 2D computer animation (CGI) in a significant entertainment feature film in a "computer vision" sequence - the 'android POV' (infra-red) of Westworld's malfunctioning robotic-android Gunslinger (portrayed by Yul Brynner) on a killing spree. 1973 The English progressive rock band Pink Floyd released its eighth album "The Dark Side of the Moon" in March 1973. 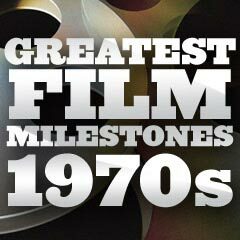 1973 To maximize profits from weekend audiences, the industry decided to move major film openings from mid-week to Fridays. 1973 One of the major celebrity events of the year occurred on September 20, 1973, when Billie Jean King won the "Battle of the Sexes" tennis match against Bobby Riggs in three straight sets at the Houston Astrodome. 1973 George Lucas' idea for Star Wars was declined by Universal and subsequently accepted by Twentieth Century Fox after his success with his second feature film - the nostalgic American Graffiti (1973). The film recreated the feel, landscape, and sounds of early 60s, small-town America - an historical time period (of JFK's Presidency and the New Frontier before the jarring assassination of late 1963 and the rest of an unpredictable era) that had since been irretrievably lost. Advertising posters and theatrical trailers for the film asked: "Where were you in '62? ", making viewers reflect back to the pre-Beatles era. It was one of the biggest hits of the year, with unknown but up-and-coming stars Harrison Ford and Richard Dreyfuss. With its great financial success, 28 year-old Lucas joined the ranks of a new breed of directors, including Steven Spielberg and Francis Ford Coppola. The film was noted for seamlessly lacing its story with a classic rock-n-roll soundtrack composed of over forty hits (often emanating from cruising car radios, or the school dance's record player). Other later youth-oriented films imitated this film's use of a pop soundtrack. 1973 In negotiations with Fox, George Lucas wisely cut his directing fee for Star Wars (1977) by $500,000 in order to gain ownership of merchandising and sequel rights. In a revolutionary approach to Hollywood film-making and merchandising, Lucas wisely accepted the small fee of $175,000 in return for the much more lucrative forty percent of merchandising rights for his Star Wars Corporation. Merchandising of movie paraphernalia associated with the film encouraged an entire marketing industry of Star Wars-related items (i.e., toys, video games, novelty items at fast food restaurants, etc.). 1973 The first full film score written by a popular artist for a film was in director Sam Peckinpah's Pat Garrett and Billy the Kid (1973), with music by pop artist Bob Dylan. Dylan also made his acting debut as the mysterious Alias, one of Billy's sidekicks. 1973 Roger Moore starred as James Bond in the first of seven films (from 1973 to 1985), in Live and Let Die (1973). He became the longest continually-serving actor in the role with 7 films over 12 years (1973-1985). Moore would be the third actor to portray Bond over a period of four years. The character Rosie Carver (Gloria Hendry) was the first black 'Bond Girl', but in the very minor secondary role, she was portrayed as an incompetent and inept CIA double-agent. 1973 Chinese-American actor, cultural icon and martial-arts expert Bruce Lee died at the age of 32, due to an acute cerebral edema, although some controversy surrounded his demise. His most notable (and last completed) film was Warner Bros' Enter the Dragon (1973), a hit film that caused an upsurge in interest in martial arts and kung-fu. The fast-paced martial-arts film was the first kung fu film produced by a major Hollywood studio. In the film, Lee (who choreographed the action) portrayed a martial arts expert seeking revenge on a gang that killed his sister, by entering a martial arts competition hosted by the kingpin (John Saxon) with a deadly prosthesis. 1973 Ten-year-old Tatum O'Neal became the youngest winner ever in a competitive Academy Awards category when she won Best Supporting Actress (presented in 1974) for her performance in Paper Moon (1973), surpassing 16 year-old Patty Duke's earlier record. 1973 Director John Ford died at the age of 79. He was noted for his influential westerns (Stagecoach (1939), My Darling Clementine (1946), the 'cavalry' trilogy: Fort Apache (1948), She Wore a Yellow Ribbon (1949) and Rio Grande (1950); The Searchers (1956), and The Man Who Shot Liberty Valance (1962)) plus other adapted dramas (The Informer (1935), The Grapes of Wrath (1940), How Green Was My Valley (1941), and The Quiet Man (1952)). He won a record four Best Director Academy Awards during his career, in 1935, 1940, 1941 and 1952) and won Best Picture in 1941. 1973 Edward G. Robinson died at the age of 79, most noted for his portrayal of gangsters, in Little Caesar (1930) and Key Largo (1948), and in film noir dramas including Double Indemnity (1944), The Woman in the Window (1945), and Scarlet Street (1945), as well as The Ten Commandments (1958). His last film was the science-fiction classic Soylent Green (1973). Just after his death in late 1973, he was awarded a posthumous Honorary Academy Award - remarkably, he had never been nominated for an Oscar. 1973 Leggy actress Betty Grable died at the age of 56 of lung cancer. She became widely known as the most popular pin-up girl for GI's fighting in WWII - in an iconic picture of her backside in a white one-piece bathing suit, as she coyly looked back over her shoulder. As 20th Century Fox's top star of the 1940s, she starred in Down Argentine Way (1940), Moon Over Miami (1941), Springtime in the Rockies (1942), Pin Up Girl (1944), The Dolly Sisters (1945), and her most popular film Mother Wore Tights (1947). She was both the top box-office star for many years during the decade, and the highest paid female star in Hollywood.